Silver Silk and Reflections of Tao …. more photos! 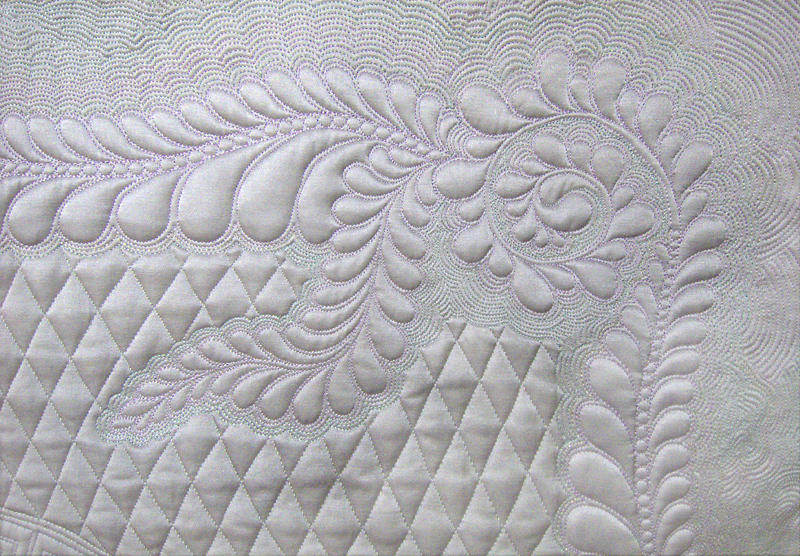 When I started quilting and experimenting with different colors of thread, I was amazed! 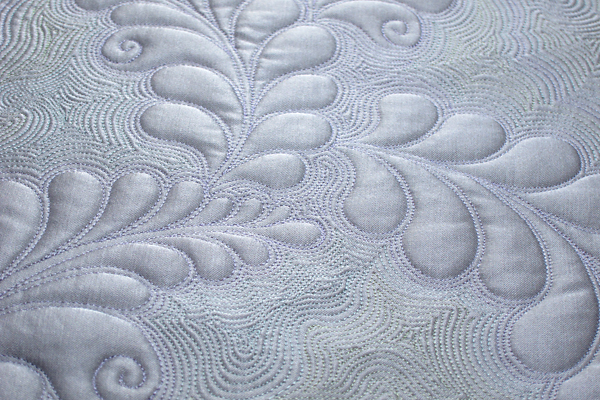 I have taken too many photos and spent too much time experimenting with Photoshop to get the best [at least, the best that I can] color balanced photos to show you the amazing effect of different colored silk threads on this fabric. The photo to the left is the feather plume that started it all. 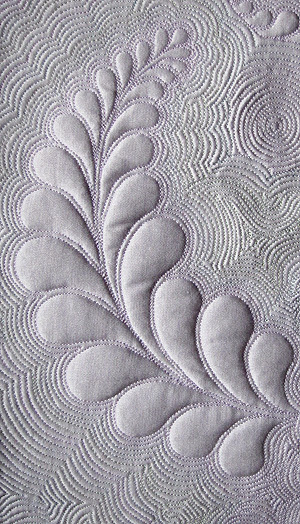 The feather looks lavender (instead of silver) because I used lavender thread to quilt and outline the feather. Then I switched to shades of aqua / light green thread for the outline stitching, and the fabric takes on the greenish hue of the threads. 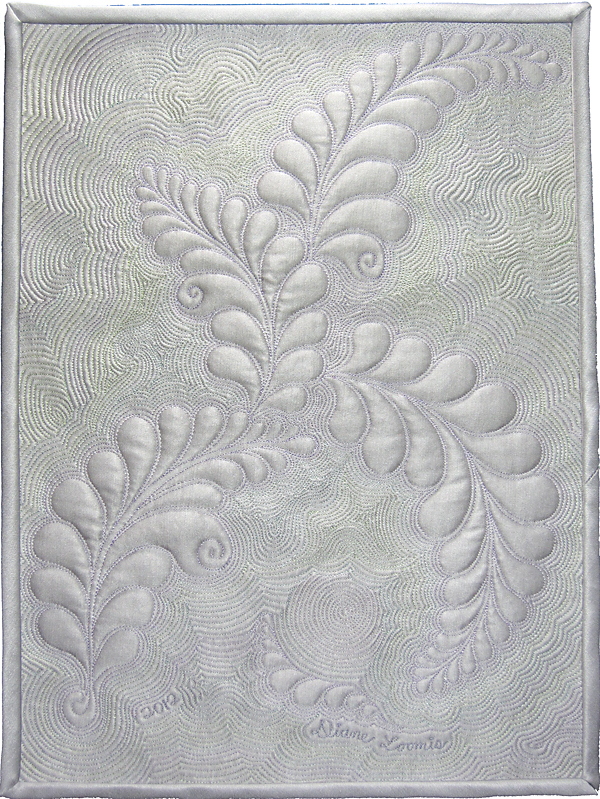 I used the silver silk fabric for the ‘Reflections of Tao’ wholecloth wall hanging to experiment more with different colors of silk thread quilted into this fabric. 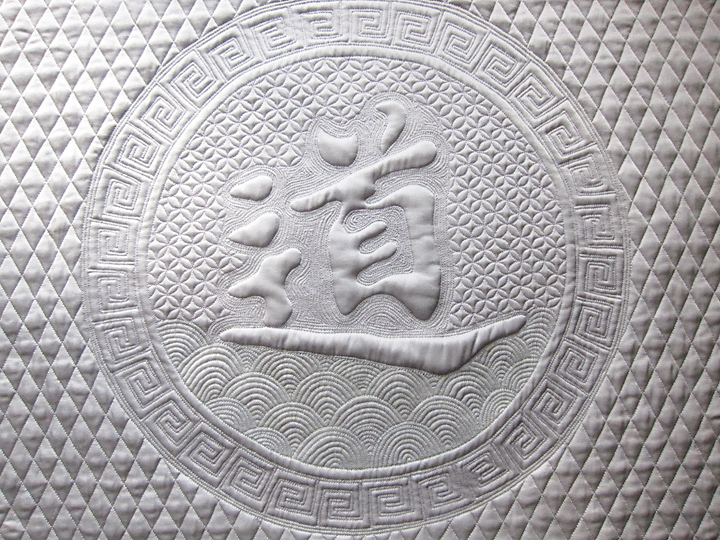 The center of the ‘Reflections of Tao’ wall hanging features the chinese character ‘tao’ (meaning ‘the way’, or ‘the path’) which is trapunto’d to make it stand out even more. 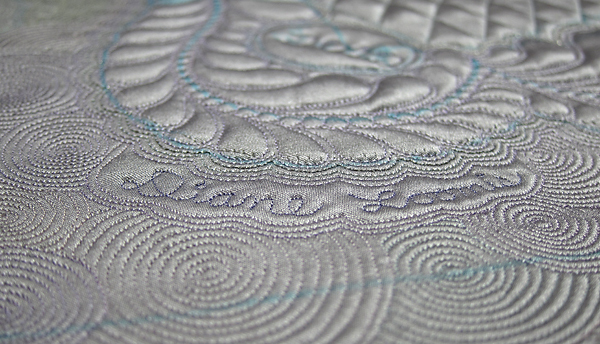 This quilt is now on display at the New England Quilt Museum as a part of the Silver Threads Challenge exhibit. The best way to see this quilt is in person, so be sure visit the Quilt Museum and look for ‘Reflections of Tao’ if you are in the Lowell, Massachusetts area in the next month. 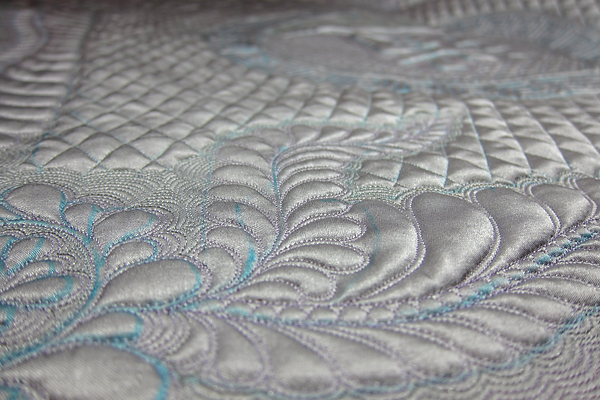 The Silver Threads Challenge quilts will be on display until late November. The New England Quilt Museum exhibited a selection of my small quilts in the Museum Shop during March and early April of this year If you were unable to visit Lowell to see the exhibit, here are some photos of the display. Yes, I was pretty happy with the exhibit!